Here's a card made using the new Gerbera Daisy stamp set from FBStamps. It is a great set, and I love the images! I stamped the images on watercolor paper and embossed with white embossing powder. Then I pulled out my Altenew inks and water colored them with pinks, oranges, and yellows. I fussy cut them by hand and arranged as I liked them. I used a die from Mama Elephant to create the window to hold my shaker bits. I mounted it to the card front and added a few sequins with Ranger Multi Matte Medium. I stamped the sentiment with clear sticky ink and embossed it white. I added foam squares to the left edge and glued the right edge right down flat. I love how this came out, so pretty for summer! Here's what I used on this card. 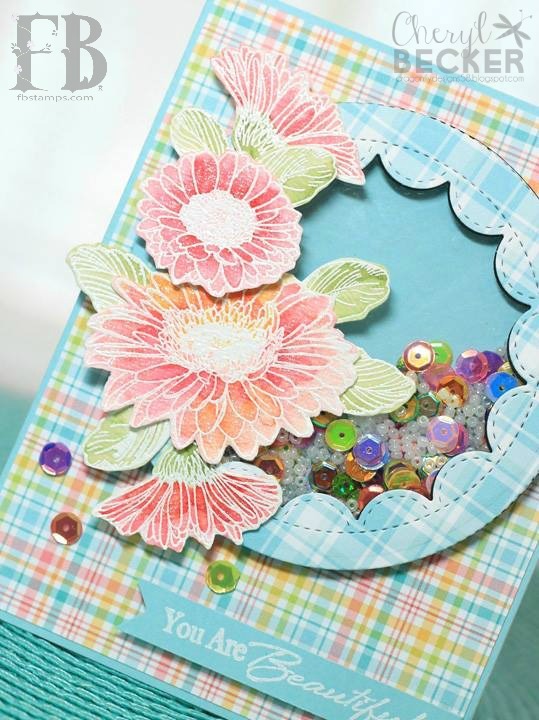 Get your craft on, and make something pretty! Check out Fleurette Bloom, you'll find lots of great things! Ilda here on Fleurette's Blog! 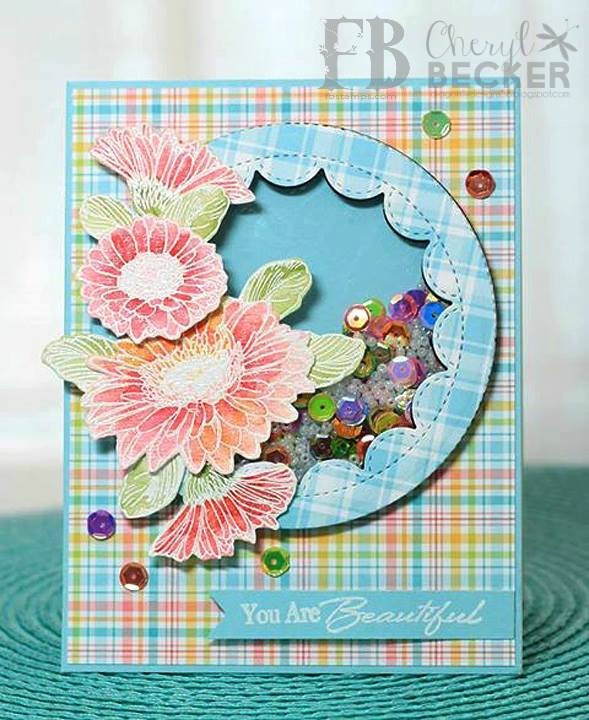 Here's a card made using a new stamp set from FBStamps. Guy cards are always a challenge and this new set is great! 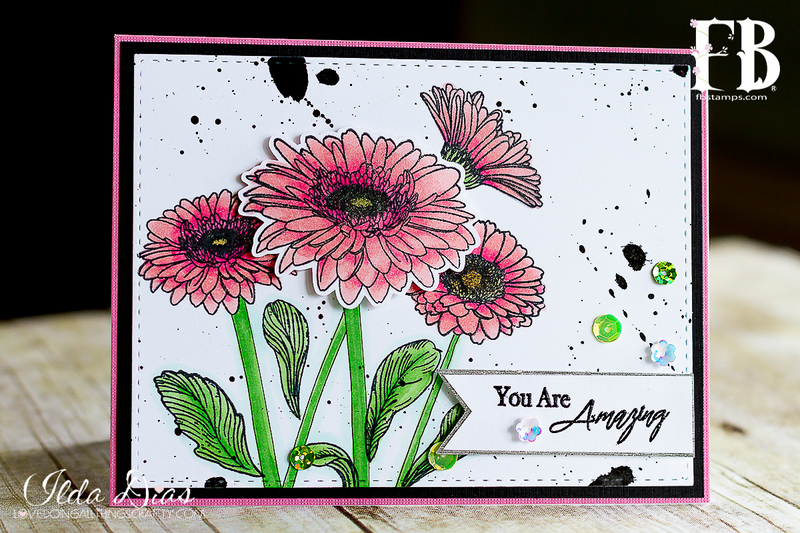 Great stamp set and great stencil to match/coordinate. 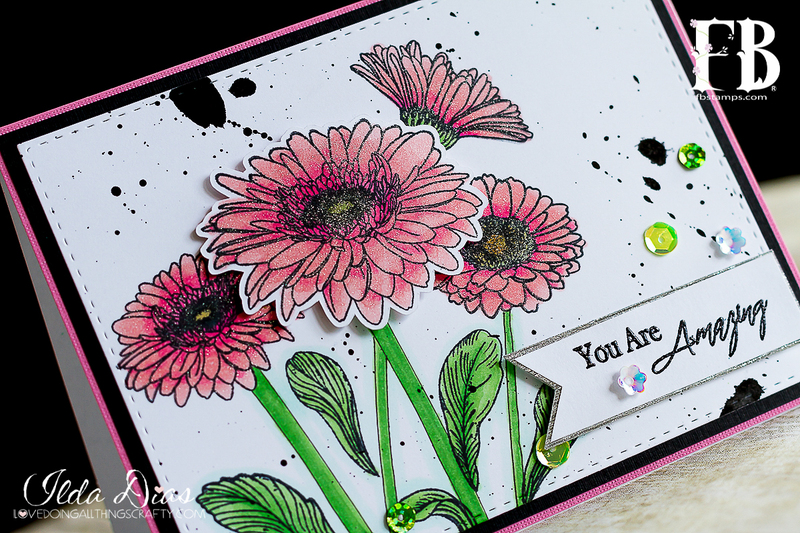 I started out by using the stencil and used several of the images to create a background. I used a couple of the light grays from Altenew. I love their ink! I used the tire tread, the gear, the nut, and the large gear. I filled in the entire piece of cardstock. Then I sized it according the the size of the cycle and used a die to cut it. I stamped the cycle and fussy cut it out. 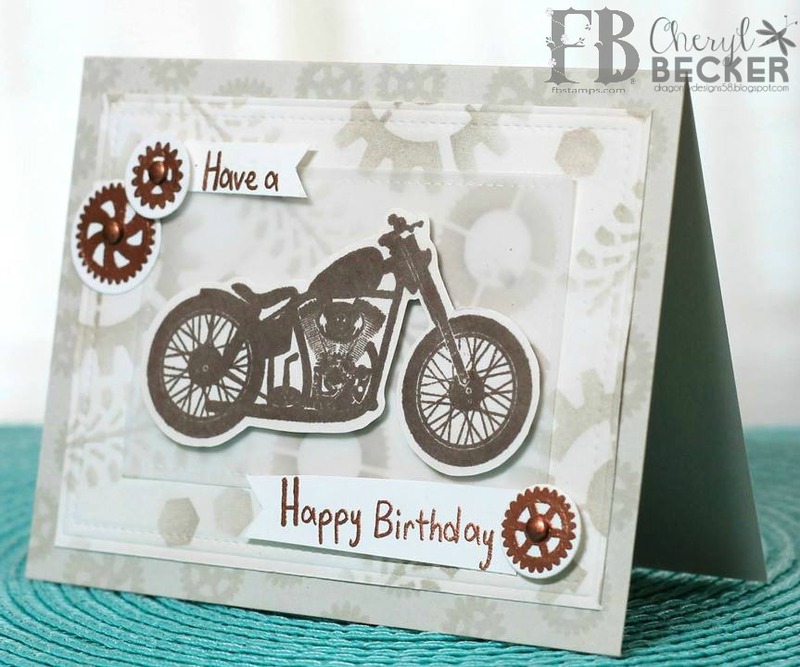 I cut a piece of vellum for under the bike to soften the stamping a bit. 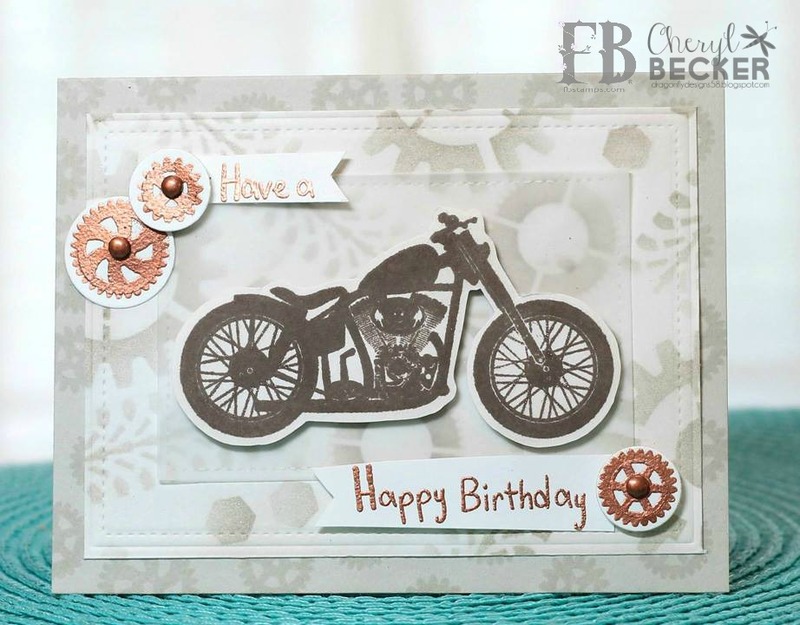 I stamped the small gears and embossed with copper embossing powder from Brutus Monroe. I put a copper brad in the center of each and added them to the front. I also stamped the greeting and embossed in copper as well. I added a bit of foam under it for dimension. To finish off the card front, under the main element, I stamped some of those same small gears using a clear sticky ink, to just give a watermark look. Then I added the main element and called it finished. Pull out your supplies and get your craft on! I have a card I made using one of the new stamp sets from Fleurette Bloom. 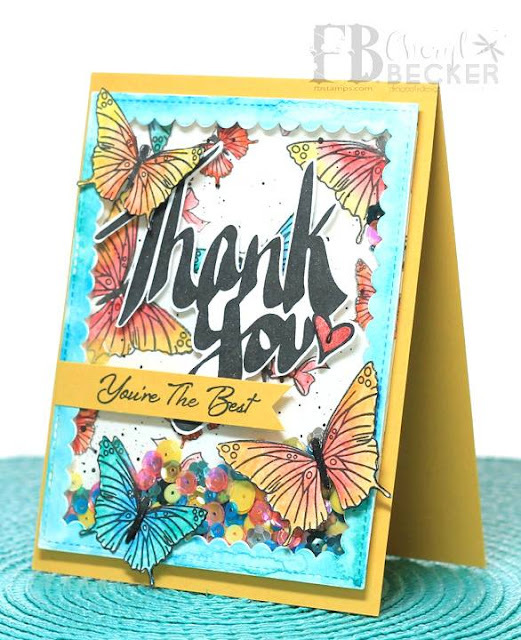 I love the HUGE Thank You stamp in this set. Here's my card. I took all three butterflies and stamped them all over the background. I then grabbed some bright colors out of my Tombow brush markers and colored them in, blending the colors together. I then took some black ink watered down and flicked tiny black specks all over. I took out my sequin stash and picked some to match the colors in the butterflies. At the time I made this card, I didn't have Fleurette's sequins. I used foam tape all around and put acetate over top to hold the sequins in. I die cut a frame, watercolored it in teal and glued it on top of the acetate. 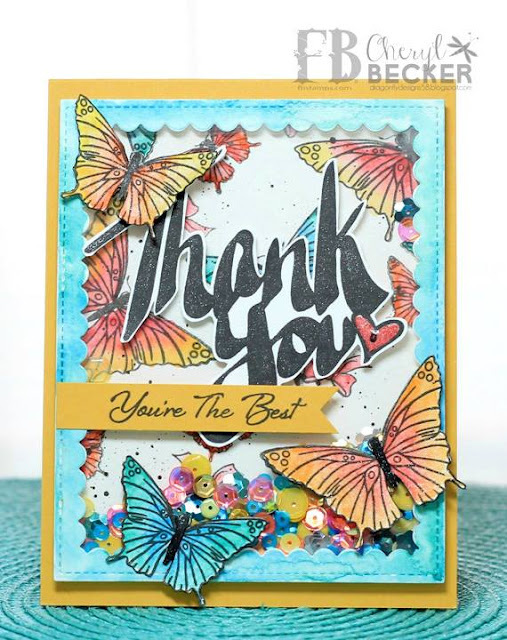 I stamped and fussy cut out the thank you sentiment and glued it on. Then added the sub sentiment and used a bit of foam under one end. Finally, I colored three other butterflies, fussy cut, and adhered them on top of the acetate. Mounted the entire card front on to a piece of bright yellow card stock. And there you have it, my finished card. Here's the products I used. So, pull out some crafting supplies and get your craft on! Be sure to head over to Fleurette Bloom and shop around...some super cute products in her store.